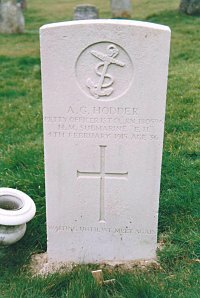 On a visit to Lyme Regis Cemetery I was walking along the lower pathway and noticed a lone CWGC headstone inscribed to the Royal Naval petty officer, A.G. Hodder who had died in February 1915 whilst serving on H.M. Submarine E.11. This prompted me to try and find out how he had died and came to be buried in Lyme Regis Cemetery. Albert George Hodder was born on the 27th December, 1878 the son of George and Mary Hodder of Mill Green, Lyme Regis. He joined the Royal Navy at Portsmouth on the 7th August, 1894 as a Boy 2nd Class aged 15 years. He was described as being 5ft 4ins in height, with brown hair, grey eyes, a ruddy complexion, had no distinguishing marks and gave his occupation as that of an Errand Boy. On reaching the age of 18 years he signed on for a twelve year engagement and had grown to 5ft 7½ins. On completion of that engagement he decided to remain in the Royal Navy and complete his service for pension. He had begun his naval career on the training ship HMS Boscawen. Within a year he had progressed to Boy 1st Class and was advanced to Ordinary Seaman in December 1896 and then to Able Seaman in January 1899 whilst serving on the 7,700 ton 1891 - 93 class cruiser H.M.S. Gibraltar. She was a coal fired warship and her main armament was 2 x 9.2-inch guns. In May 1903 serving on the 3,500 ton Apollo class light cruiser HMS Brilliant he became a Leading Seaman. She was sunk as a block-ship at Zeebrugge in April 1918. As a Leading Seaman he also served on HMS Latona and HMS Thames. The former was an early type of mine layer and the latter was fitted out as a floating workshop. He gained his promotion on HMS Thames to Petty Officer 2nd Class in April 1905. Two years later in May 1907 he became Petty Officer 1st Class and was drafted to HMS Roxburgh an 1898 class coal-fired cruiser of 10,500-tons. His next ship was HMS Duke of Edinburgh, a 1903 cruiser of 13,550-tons, coal/oil fired with a main armament of 6 x 9.2-inch and 10 x 6-inch guns. When not serving afloat he was sent to various shore establishments including HMS Mercury the Royal Naval Signals School. In the autumn of 1908 he was drafted to HMS Vernon, the Torpedo Establishment of the Royal Navy from where he qualified as a technician. He then served on Submarine Depot ships from 1911, the first being HMS Bonaventure an Astra class 1896 coal-fired vessel of 4,360-tons. Service on HMS Arrogant and HMS Maidstone, both submarine depot ships, followed from which he served on submarines attached to the depot ship. It was from HMS Maidstone, his last surface ship that he was drafted to HM Submarine E.11 as coxswain. Prior to the E.11 he had served on D-class submarines. On the 4th February, 1915 the E.11 was berthed at South Quay, Great Yarmouth and during the evening Albert Hodder went ashore to purchase some food. He returned at approximately 2100 hours and was crossing over from one boat to another via a plank when he stumbled and fell into the water. The evening was very dark and there was a strong current flowing past the boats and Albert was swept away. The alarm was raised that a man has fallen overboard and a naval petty officer from the adjacent boat hurried on to a collier which was berthed astern of the submarine. From the stern of the vessel he saw a dark object float by. He then boarded a tug boat but was again thwarted in effecting a rescue. It was fortunate that a small rowing boat used as a ferry was in the vicinity. The ferryman who had heard the alarm that a man was in the water rowed to and fro. He saw the man and managed to grab hold of him. With one oar he paddled the rowing boat alongside the quay. There, the naval petty officer helped to get the man, Albert Hodder on to the quay. A number of people had gathered at the quayside and one was sent to get medical assistance. Artificial respiration was applied and a doctor attended to Hodder until his breathing became normal. He was then taken to the shore-side sick bay on a stretcher. There he was put to bed with hot water bottles and warm blankets and left in the care of a medical orderly. The doctor was again sent for and on arrival he found that Petty Officer Albert Hodder had died. He was thirty-six years of age. An inquest was held on the 5th February in the Town Hall at Great Yarmouth into the circumstances surrounding the death of Albert Hodder. It was established that no one had actually seen the deceased fall into the water. The ferryman, Mr Albert Childs stated that he had been close to the E.11 and heard the shout that a man had fallen overboard. He rowed backwards and forwards past the scene and eventually noticed the man floating and caught hold of him by his jacket. Using one oar he got alongside the quay where a sailor helped to get the deceased out of the water and eventually on shore. Dr J. Sankey attended Hodder and applied artificial respiration with the help of police constable. Taken to the sick bay he was put to bed and later died due to 'asphyxia from drowning'. The jury returned a verdict that deceased accidentally fell into the water and died from the effects of his immersion. Albert Hodder had served in the Royal Navy with an unblemished career for 21 years and his character had been marked as being 'Very Good'/'Superior'. He had been granted three Good Conduct Badges, the first on the 27th December, 1899, the second on the 26th December, 1904 and the third on the 25th December, 1909. The Admiralty offered to bury Albert Hodder with full military honours at Great Yarmouth or they would return his body to Lyme Regis for private burial. His Mother chose have her son buried in Lyme Regis Cemetery. On the day of the funeral, 14th February, the town paid its respects by flying flags on prominent buildings at half-mast. The coffin, draped with the Union Jack was borne on a hearse from his mother's house to the parish church. A muffled peal was rung as the cortege approached St Michaels', where a large congregation had assembled inside. Albert Hodder's father had died a few years previously and his mother was accompanied by her son, stepsons, nieces and cousins. The Mayor and town officials were also present as well naval personnel who had served with Albert and many local friends. After the funeral service the coffin was taken to Lyme Regis Cemetery, where a short burial service was conducted before Albert Hodder was interred. After the burial a large number of floral tributes were arranged over the grave. 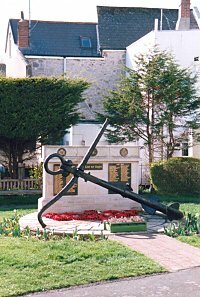 His name is inscribed on the Lyme Regis War Memorial. The National Archive ~ Alfred Hodder's Service Record ADM 188/300. Bridport News - Friday 12th February, 1915.